Made in Yorkshire from 100% British recycled plastic, the Hebden X-Grid is the highly durable, eco-friendly alternative surface for permanent and overspill car parks, private driveways, emergency vehicle access lanes, golf buggy paths, helicopter pads, cycle routes, pathways, verge stabilisation and many other uses. 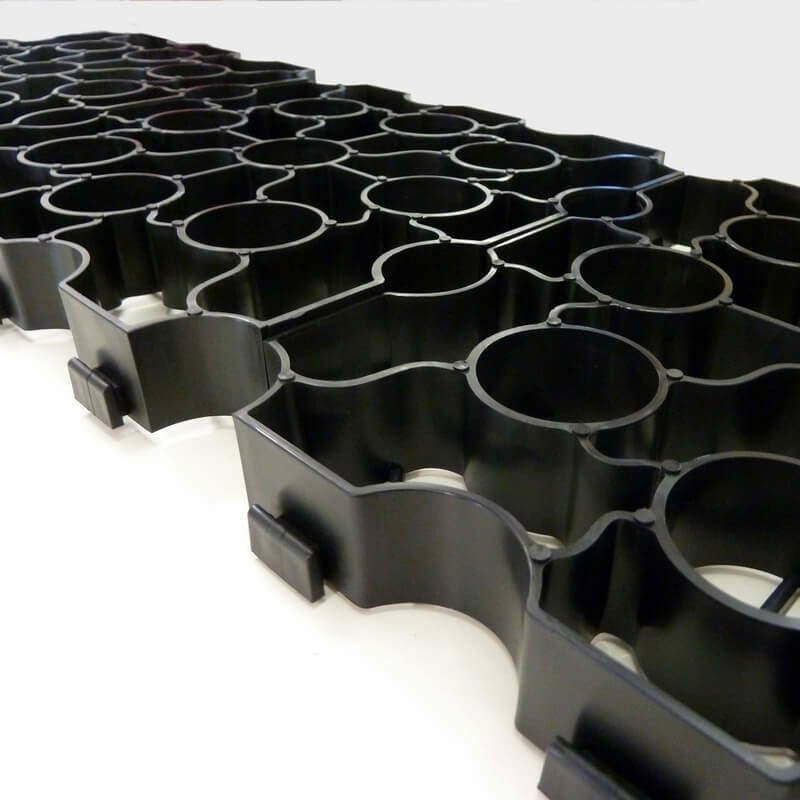 Generically, this type of product is often referred to as cellular paving, porous paving, ecopaving, permeable paving, ground reinforcement grids or plastic grid paving. Hebden X-Grid has been developed as a replacement to Hebden 402, providing greater strength for the matrix when many grids are clipped together. The Hebden X-Grid is finished with either grass or gravel allowing it to blend unobtrusively into parks, rural areas or heritage sites whilst maintaining extraordinary load bearing capabilities, unlike unsightly asphalt or block paving. This means that it’s as durable as it is eco-friendly. The Hebden X-Grid has been designed to accept the thermal expansion of the plastic without lifting at the joints. Without this feature on warm days the Hebden X-Grid would lift at the joints allowing earth to slip underneath preventing it from going back level and killing the grass in the process. This makes the Hebden X-Grid much more aesthetically pleasing than ugly tarmac or block paving. This means that the Hebden X-Grid should last for 25 years. This means that the Hebden X-Grid can quickly be laid at a rate of 100m² per person per hour. This means that the Hebden X-Grid avoids rainwater run-off into drains and sewers, allowing it to return to the water table. This helps avoid the urban “heat island” effect and makes it perfect for SUDS strategies. With a strength over 250 tons per metre² this means the Hebden X-Grid can support all vehicle types. This means that the Hebden X-Grid can easily be laid on an undulating surface. This means that it is easily transported, resulting in less CO2 emissions than for the conventional alternatives. Take a look at this installation of Hebden 402, predecessor to the Hebden X-Grid, used to create a parking area on a grass lawn.